Are you ready for one of my super-secret all-time favorite recipes? 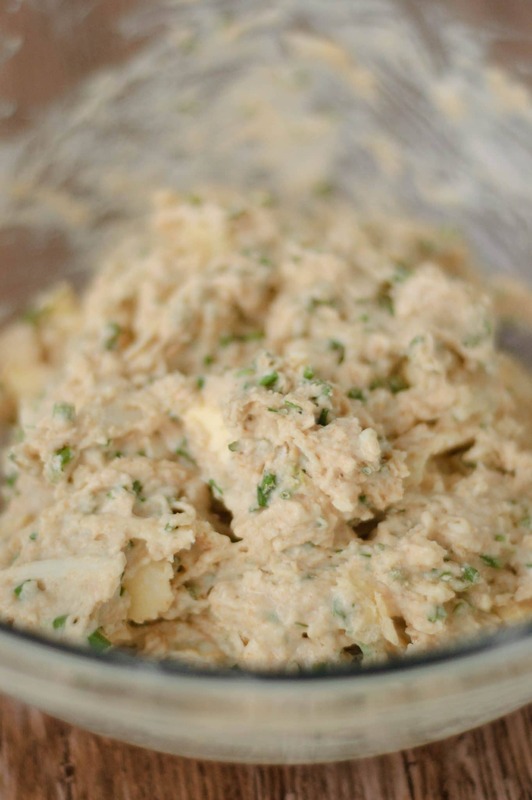 This is one of my go-to favorites because it’s kind of my fridge-dump recipe. Sometimes there are just those weeks where things don’t go according to plan and you end up not being able to make everything that you bought groceries for. Then, you get up one day, look in the fridge, and discover that disgusting mildewy thick water has begun accumulating inside of your bag of spinach and think, “Oh Crap! I need to use these groceries now or they’ll have to be thrown out!”. That is what this recipe is for. You have many different options for how you can change it. 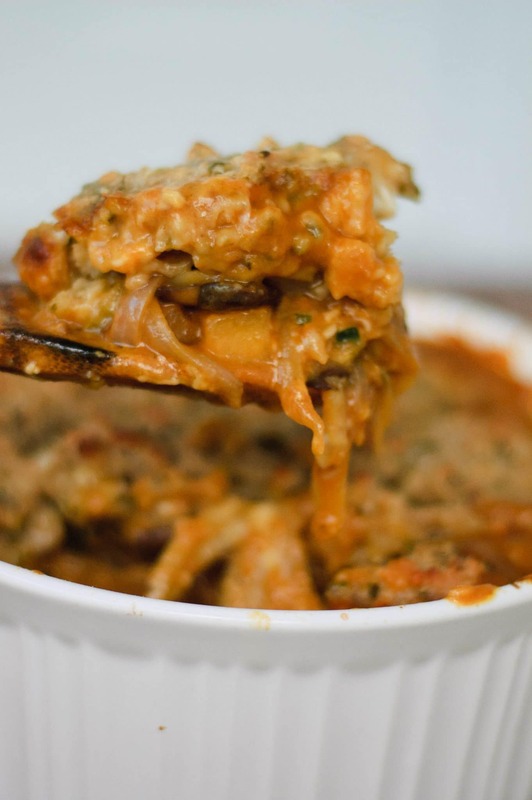 You can change the cheese and the herbs in the biscuit topping, you can use any 5 cups of cooked vegetables that you happen to have hiding in the fridge or freezer, you could change the type of cheese in the filling (I love to use smoked gouda when I have it! ), or even deglaze with some wine for an extra flavor boost. This is an excellent recipe to have hiding under your belt, and when people come over to eat it – they are always super impressed, thinking you slaved away for hours. I know that when you look at the actual recipe, it looks incredibly complex and difficult, but I promise you it really is not – it is sure to become your new favorite! I seriously hope you are ready for this, because I’m giving this recipe up with great difficulty. Do it proud. As you can see, there are many ways to change it up and fine-tune it how you want. If you decide that you want to start experimenting with it, the only part that may pose a problem is the sauce. In this recipe I used pumpkin purée as part of the thickener, but in any other season (or with a totally different flavor profile) you may choose to not add it. In that case, I recommend upping the amount of flour to 1/2 cup and adding additional stock as necessary – you may or may not need it, so this is a great excuse to exercise your #KitchenConfidence. You can do it! Before you begin making today’s yummy pumpkin cobbler, I recommend brushing up on these cooking techniques and skills to help make this process easy and effortless. How To Roast Garlic : if you want to add roasted garlic. This pumpkin cobbler makes A LOT of food. Even if you’re eating it as an entrée, you’ll likely have extra at the end of the meal. If that happens to you, you can store it in the refrigerator in an air-tight container for 5-7 days. Just a heads up; the longer the cobbler sits, the more the flavors intermingle and strengthen, so if you have a sensitivity to some of the flavors (like fennel) you may want to eat it sooner than later. Uncover the cobbler and place it on a sheet pan. Bake for 30 minutes, or until hot throughout (cook times will vary based on how much cobbler you have left). Note: If you notice that the biscuits start to get to dark or begin to burn, you can cover them, or the entire container, with some aluminum foil. Just make sure to leave a vent in the side or on top to allow steam to escape. For today’s recipe I am using homemade puréed pumpkin (you can use canned pumpkin if you prefer), but you can easily replace the puréed pumpkin with diced pumpkin if you would rather. 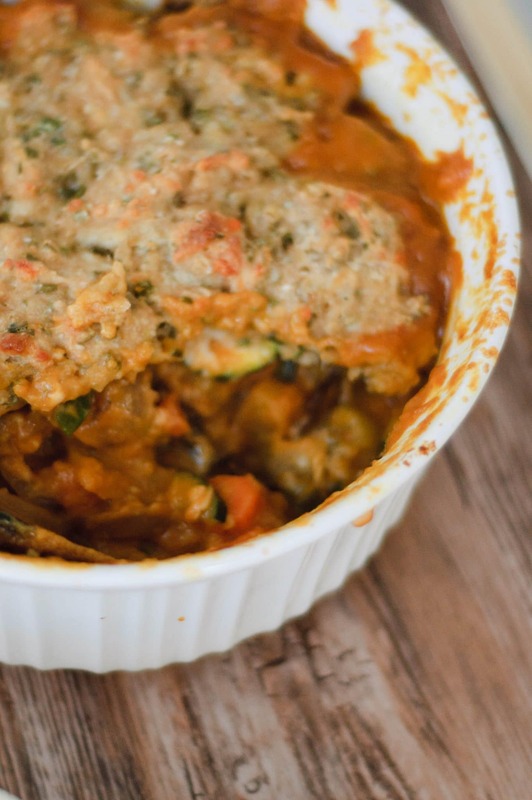 Try this cheese-packed deep dish pumpkin cobbler that is filled with your favorite veggies and topped with parmesan chive biscuits. 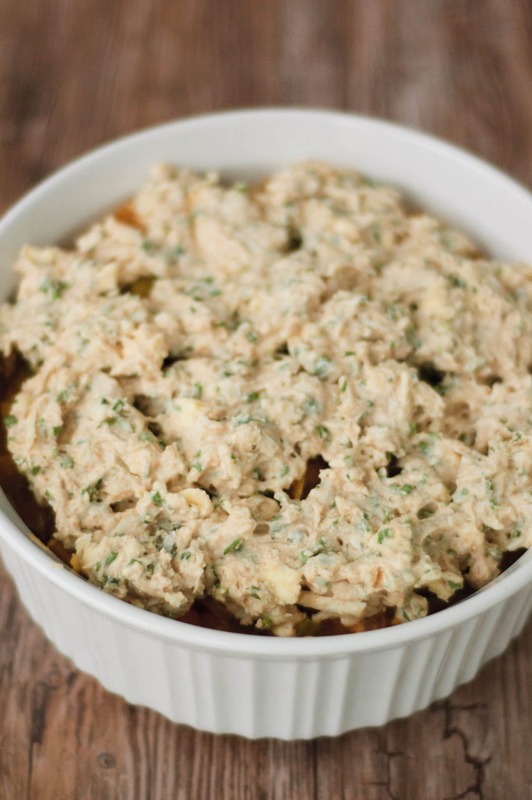 You'll need a deep 2 1/2 quart baking dish for this recipe. Sift together the all-purpose flour, whole wheat flour, salt, and baking powder. Cut in the butter into the flour, leaving behind pieces no larger than a pea. Add in the chives and parmesan. Stir in the buttermilk until everything is just combined - the dough may be a little sticky. Cover and set aside. In a heavy bottomed sauce pan, melt the 2 tablespoons of butter over medium heat. Add in mushrooms and cook until they are caramelized - about 5 Minutes. Be careful not to stir too much or they won't caramelize. Add in garlic and cook for 1 Minute. Transfer mushrooms and garlic to your 2 1/2 quart baking dish and set aside. Melt one more tablespoon of butter and sauté your onions until they are translucent, about 2 Minutes. Stirring as needed, add in carrots, celery, turnips, zucchini and fennel and cook until they have begun to caramelize, about 15 Minutes. Transfer to baking dish. Using the same pan over medium heat, deglaze the hot pan with 1/4 cup of the vegetable stock, scraping the bottom of the pan to release the caramelized bits. Reduce until it is mostly gone. Add in the butter and melt until it is deeply browned. Add in the flour until combined and let cook 1 Minute. Using a whisk, slowly mix in the remaining vegetable stock until smooth. Mix in pumpkin purée, and cook until mixture begins to thicken, about 2 Minutes. Add in parmesan cheese and cook 1 Minute until melted. Mix vegetables into the sauce and toss until the vegetables are all coated. Transfer back into the baking dish. Using a spoon, drop the parmesan chive biscuits on top of the baking dish until all of the biscuit topping is used. Place the filled and topped baking dish on a sheet pan and place in the oven. Bake for 30 Minutes, or until parmesan chive biscuits are cooked through and browned. Remove and let stand for 10 Minutes before serving. I laughed out loud at your “slime” in the spinach bag comment — and yes that definitely happens to me! 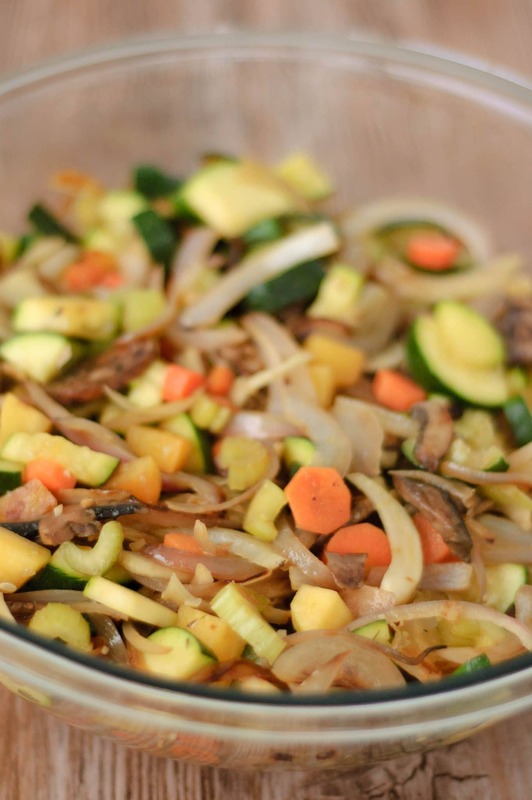 Like you, I will take the scraps of vegetables (and leftovers) to put into a casserole, soup, or other dish. This sounds right up my alley, thank you! I can’t even tell you how much I love the sound of this recipe, Mackenzie! 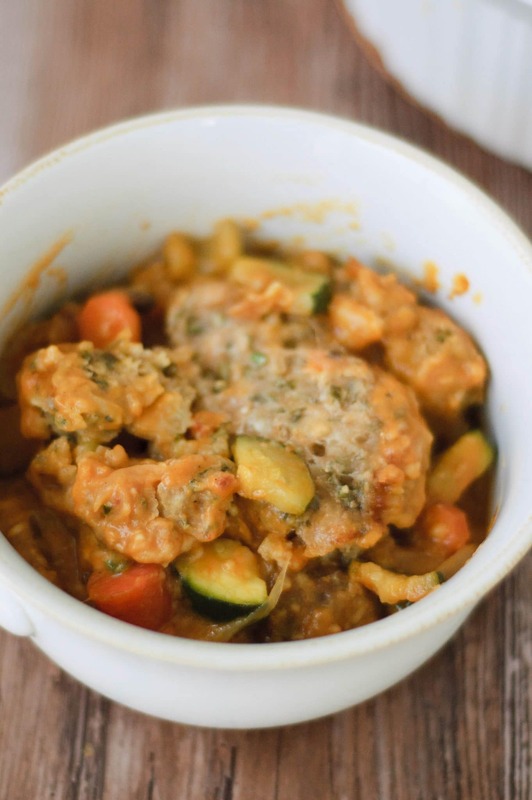 Pumpkin and parmesan are one of my favorite flavor pairings, and those biscuits sound divine. 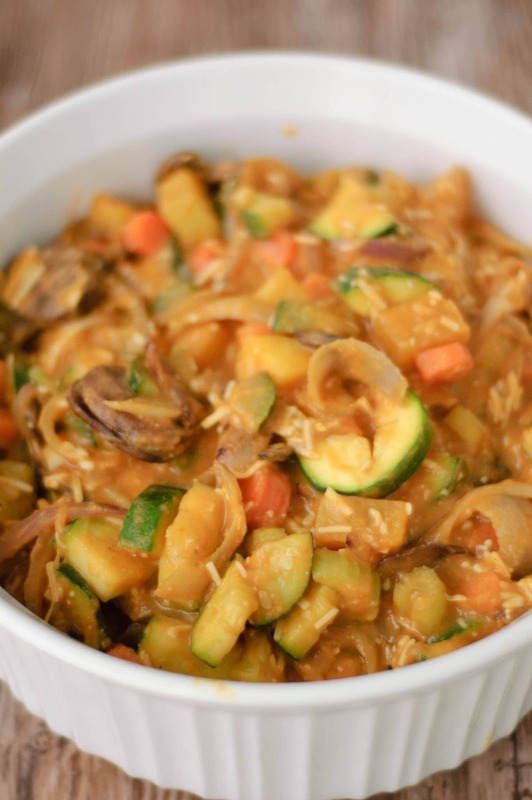 What a creative, comforting, and flavorful dish as we transition into the fall season! This recipe is unlike anything I have ever seen before. It sounds so delicious and I would love to give it a try!